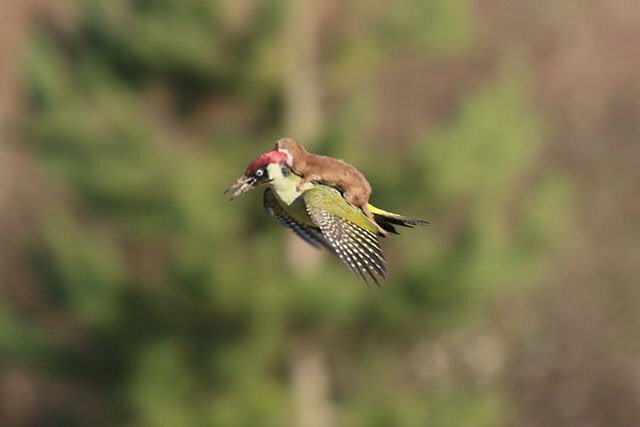 A photographer and birdwatcher in London has captured a strange and rare photo that has the Internet abuzz: an image showing a weasel riding on the back of a woodpecker as it flies through the air. Martin Le-May was walking with his wife through Hornchurch Country Park in east London yesterday afternoon when he heard loud squawking. He saw a woodpecker flying in his direction and quickly snapped some photos of what was unfolding. Wildlife expert and BBC presenter Lucy Cooke explained why it was particularly unusual.